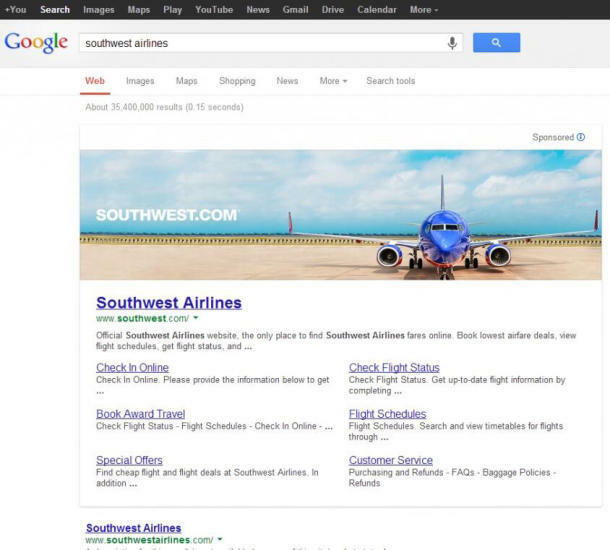 Breaching a promise made by Marissa Mayer in 2005 as vice president of search products division, Google is testing placing advertising banners on Google Search results page, directed based on used search terms. In a message posted on the official blog, Marissa Mayer promised that there will never be advertising in the Google home page and search results pages, and users will not be bullied by flashy banners that appear across Google. But on Google Search results pages could be seen advertising that sacrifices a large portion of usable space on the screen. As shown in the example above, in addition to company logo and link to homepage are also provided a lot of links to its services. According to statements of the company’s spokesman, advertisements included in Google search results were experimentally presented, only for a small number of users in the United States. But the test comes after Google has increased the limit on the maximum size of images accepted for sponsored links, the effect is turning them into true banners in disguise. Therefore, we speculate that the present experiment is actually a Preview for a new advertisment policy, which will be implemented at the right time.